If I were an international student and I wanted to work in the United States, I would do whatever it took to get some professional experience and make some connections related to my career field. This includes volunteering – which could also be called taking an “unpaid internship.” The idea is that you’re new at something, not likely to secure a paid role that works with your timing, and hoping for a chance to get on the inside to create opportunity for yourself. Theoretically, companies wouldn’t be willing to pay someone like you to do a particular job (because of your lack of experience, lack of work authorization, lack of availability, etc. ), but they would be willing to have you perform some low risk tasks if it doesn’t cost them anything. In return, you get the experience and connections I mentioned above. 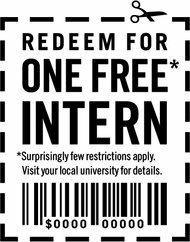 However, a recent court case challenging the concept of unpaid internships illustrates how dangerous these arrangements can be for employers. I suppose that calling a work assignment an internship suggests that the intern will be receiving some sort of training or development – a concept difficult to define or enforce. But given how many of these volunteer roles tend to be informal and behind the scenes, I suspect that it is more often the resume-conscious student who adopts the title “intern,” than the employer who really feels like they’re just helping someone out by accepting a volunteer. In any case, as an international student, I wouldn’t let the unpaid nature of an internship deter me from pursuing an opportunity to make connections in the company. Internships, whether paid or unpaid, are the best way to penetrate the hidden job market, and a fast track to credibility in an unfamiliar market. I only worry that lawsuits like the one mentioned in the article above are going to scare employers away from agreeing to unpaid internships, and in doing so remove one of the most potent job search techniques for international students and career changers.